Meet our next sponsor in the Bloggy Blessingway - Novena Maternal Skin Care! They specialize in skin care products - some for special maternal needs like belly and breast creams to help reduce and improve stretch marks and itchiness - and other products suitable for any woman, pregnant or not, including sunblock, eye gel, moisturizer, face wash, and more. And not only are their products good for you, they're also safe for your growing little one. 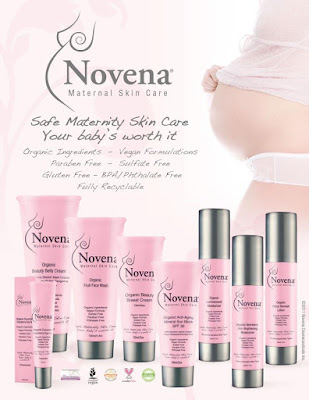 I had the opportunity to try Novena's Organic Anti-Aging Mineral Sun Block SPF 30 and their Organic Beauty Belly Cream. They also sent me some samples of their Organic Bearberry Skin Brightening Moisturizer. Read on to see what I thought of their products! - It's all manufactured, packaged, and boxed all here in the USA! Wooo! Team USA! :) Their products are high quality but still affordable. - No overpowering, knock you over kind of scents. I've tried some stretch mark creams/lotions made especially for pregnant bellies before and oh my...the shea butter or other products in them are usually SO strong. These did not have anything like that. Although the Belly Cream said it was odorless, I think it has just a *hint* of a clean, fresh scent - but it's very light. - All of the products I tried absorbed quickly - perfect for busy mommas who have a limited amount of time for products! - I don't generally have sensitive skin but the Belly Cream really helped with the itchy tummy I was just starting to have from the stretching my belly is doing during this pregnancy. ** SPECIAL DEAL: Novena has provided all Wonderfully Chaotic readers with a 10% discount coupon code that is valid until February 13th, 2013. Just enter WCBNOV when placing an order on their website. They have also generously donated another set of the full size products I tried to one of my lucky readers for our week of giveaways! Just enter on the Rafflecopter form below. These products sound really great! Too bad I'm past my pregnancy years. I will certainly pass the information along to a couple of my friends who are expecting though!